Hard-hitting Denver strawweight prospect JJ Aldrich (4-1) is taking her talents to the UFC. The 24-year-old will make her official debut inside the world-famous Octagon opposite Brazilian star Juliana "Ju Thai" Lima, Dec. 9 in Albany, N.Y. It's a fight that could solidify her spot on the UFC roster, and push her into the top 20 in the world at strawweight. For Aldrich, the road to the premier MMA organization in the world was a long and windy one. After falling short against Tatiana Suarez on "TUF 23," it was looking like her UFC hopes and dreams were dead. She went just 1-1 on the reality show, and didn't get called to appear on the card of the show's finale. After that, Aldrich had no choice but to head back to the regional ranks, taking fights with FCF and Invicta Fighting Championships. The goal was to sharpen her skills, earn a couple wins, and stay on the radar of the UFC's matchmaking team. With a little good luck, a pair of strong performances and sharp timing, that's exactly how the plan unfolded. 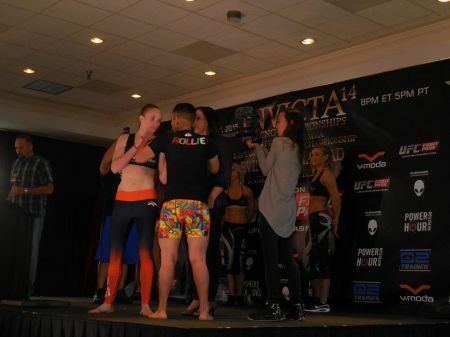 Aldrich knocked out Kathina Catron in September at FCF, and followed with a crisp showing against Lynn Alvarez on last month's Invicta FC card in Kansas City, Mo. Those fights, along with an injury to Suarez, earned Aldrich an official call-up to the UFC. With Aldrich vs. Lima official for Dec. 9 in Albany, the rest of the women's strawweight division and fight fans across the globe should take notice of this fight. How will the bout play out? With Lima looking to rebound from a loss to Carla Esparza and Aldrich hoping to cement her place on the roster, both fighters will be hungry to win. The scrap has "Fight of the Night" written all over it.